The world of a children’s book writer is often spinning in a chaotically counterproductive whirlwind of messy, clumsy pitfalls. But this time, the swirl of disasters and distractions has lead to a clever and creative concept for a new book: My Worst Book Ever. 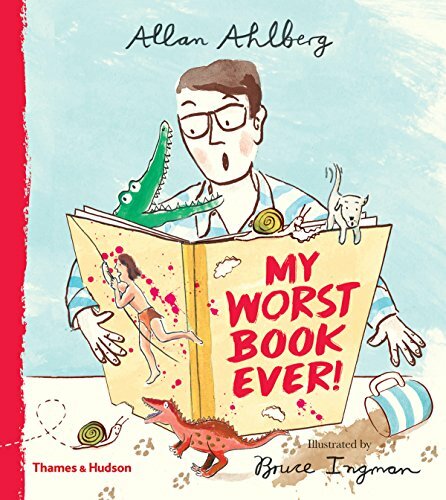 With no name identified for the protagonist (whose job is author), and with the illustrator in the story named Bruce, one assumes it is Allan, My Worst Book Ever’s author himself, whose foibles and mishaps are being autobiographically chronicled. Everything that could go wrong during his creative process does indeed come about and Allen, a veteran storyteller, is not phased by any of it . . . too much. A smashed fly carcass. Spilled coffee. Muddied cat paws. Family vacation. Hungry snails. The things that conspire to distract the genius of a writer are all lurking around. And that’s before the visit with the illustrator, Bruce, who lends different perspectives to thwart the author’s premise. Then in come rowdy children with sticky red lollipops dripping all over the artwork. Even the publisher throws in her own ideas to mix things up all in the name of collaborative teamwork. Will this book ever get finished? When the pages are finally sent off to the printer, it’s still not a slam-dunk. Splattered chocolate handprints. Incorrect artwork. Pages out of order. Inconsistent fonts! The file that gets printed is completely wrong. Tragedy strikes. The cover, the first and most important impression, has an image that does not belong. What’s an author to do? In this case, frump a little, then capitalize on the errors to make a humorous story and move on. A story about a story can be a tricky thing to maneuver visually. Ingman however, has a strong talent that is capable of handling illustrations for both stories. He, in essence, is illustrating two books: My Worst Book Ever and Crocodile Snap! (which is the said worst book about which we are reading). Ingman’s illustrations are fantastic. Sepia tones set the base of the drawing with sparse, subtle yet effective blue, red and yellow used strategically in the My Worst Book Ever portions of the story. In the Crocodile Snap! pictures, the color scheme is reversed with full color predominant and sepia sketches used sparingly. Page layouts are distinct and have a natural flow that matches the text. A highlight is the pair of fold outs with the storyboards of what Crocodile Snap! should have been and the My Worst Book Ever that it became. Side by side layouts allow immediate comparison of the errors which readers will enjoy finding on their own. The characters—Allen, Bruce, the publisher, the family members, etc.—have energetic personalities and lively expressions. They have a retro feel reminiscent of the figures of Leonard Kessler from the 1950s and ’60s books, like Mr. Pine’s Purple House (1965), which makes this book feels like it is already a classic. But for today, this is an equally lively and energetic book, by an established and masterful duo.